Our continuity clinic, Prevea Health Family Medicine, is in a highly visible and accessible area of Eau Claire, across the street from HSHS Sacred Heart Hospital and minutes from Mayo Clinic Health System-Eau Claire Hospital. Our clinic is a state-of-the-art medical facility located within the Health Education Center of Chippewa Valley Technical College. Our family medicine curriculum provides an excellent balance of training in internal medicine, outpatient procedures, pediatrics, and obstetrics. Flexible electives provide you with time to explore personal areas of interest. The UW DFMCH is pleased to offer generous and competitive benefit packages for residents in our programs. Come see what your next three years could be. Visit Eau Claire! 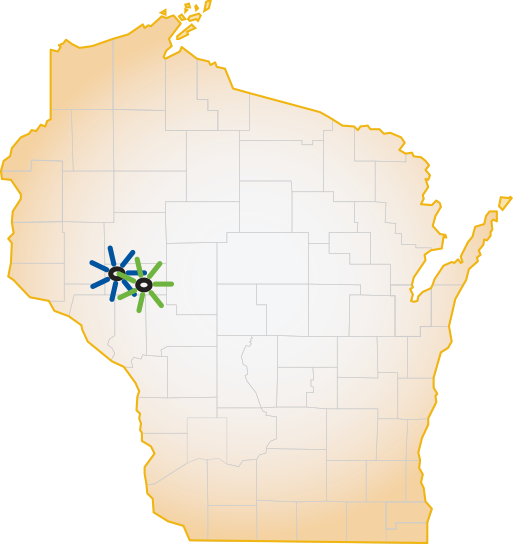 Home to UWEC, Chippewa Valley Technical College and Immanuel Lutheran College. The economic base is made up of manufacturing, health care, information technologies, and retail trade. Multiple recreational opportunities.